Santosh Sivan on Mani Ratnam! Santosh Sivan is a true magician and there is no about it. The ace cinematographer is the first South Asian to join the board of the elite club of world-class visual artists at the American Society of Cinematographers (ASC) in Hollywood. We also know that the nine time National Award winner is close to ace director Mani Ratnam too. 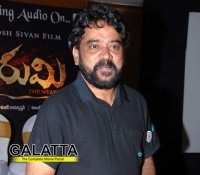 This is what Santosh Sivan had to say about the Kadal director. The thing about Mani is that he looks at every film like the first film he makes. Both of us do. It always brings freshness to the relationship too, because then there is so much to speak about and explore through cinematic vision that we’ve not seen before. I take pride in the fact that we are versatile as a team. It was with him that I learned how to film songs.